Final videos and b-roll footage will become the property of SVTP who will be granted unlimited usage rights for marketing and public relations efforts. Delivery of pre-existing footage, graphics, etc. *If deadlines are met early the timeline will be adjusted accordingly. Life Focus Pictures was founded in 2011 in Central VA and provides high converting lifestyle photography and video content. Currently, LFP creates video content in both English & Spanish for over 200 organizations worldwide. With expertise in strategic marketing, theatre and film, Life Focus is uniquely positioned to capture the story of the Shenandoah Valley while simultaneously implementing social media marketing strategy. In a recent video project for a startup in Fort Wayne, Indiana, the client reached 28,582 people on Facebook with 13,202 video views & 985 comments, reactions, & shares, 141 new page likes within the first 48 hours. The video was also placed on Instagram at the same time and received 8,311 impressions, 3,658 views, 157 comments, 112 new followers. The combination of video ad placement on both platforms resulted in sales within minutes of posting the content. We have three core members on our team which keeps our operations lean and helps us maintain competitive pricing. Our team expands to include specialists like scriptwriters, drone pilots and translators based on the complexity of the project. 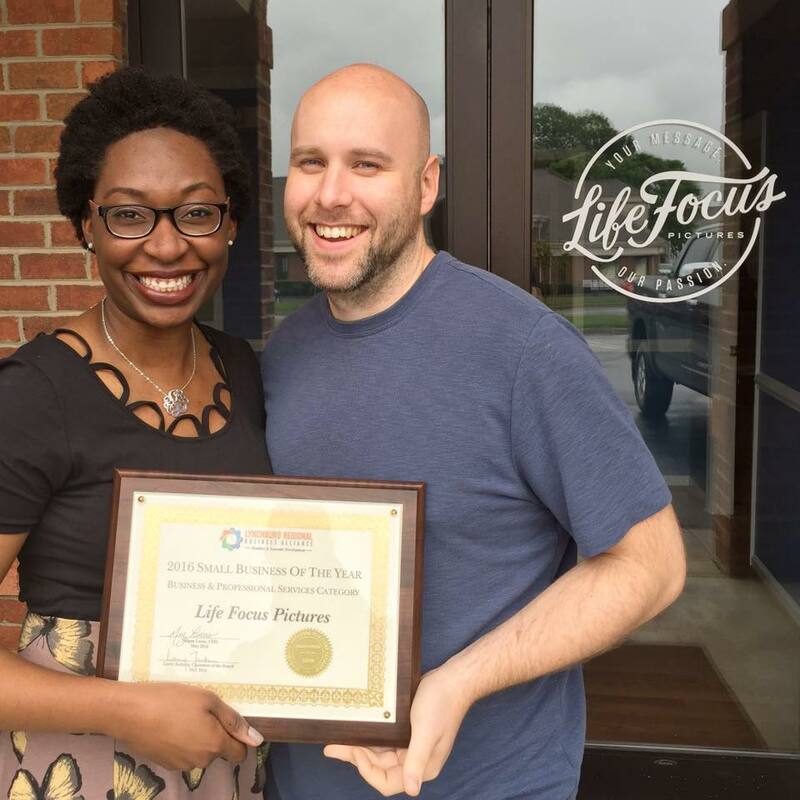 In 2016, Life Focus was awarded Small Business of the Year in the Business/Professional Services category by the Lynchburg Regional Business Alliance. All three team members actively produce content for revenue producing YouTube channels which keeps the team on top of the latest trends in video marketing. After serving 6 years in the United States Marine Corps, Joshua founded Life Focus Pictures and currently serves as a principal partner and director. He has directed over 400 videos over the past decade. Projects ranged from industrial training videos, quirky web content to large scale ad campaigns for international brands including TEVA, Fleet Laboratories, & The Salvation Army. LaShonda has consulted over 100 organizations internationally and travels around the country teaching service organizations how to utilize public image to increase membership and giving. In 2018, she was awarded the Douglas A. Newton Excellence in Communications Award. With degrees in Theatre Arts Performance and Production, combined with a decade of experience in strategic marketing, LaShonda handles everything related to pre-production to ensure the clients' vision comes to fruition. Thomas currently serves as the Editor for Life Focus Pictures. He graduated from college with a BA in Communications at age 18. Immediately following college, he traveled around the world working on the video documentary series, Pilgramers. In 2013, he redirected his focus to narrative filmmaking. Since then, he has worked constantly on projects ranging from commercials to feature films. He has a wide range of skills and is proficient in editing, lighting, cinematography, and animation and currently maintains a video essay YouTube channel with 43k subscribers.